I love sweetened grapefruit - it's zesty and delicious. 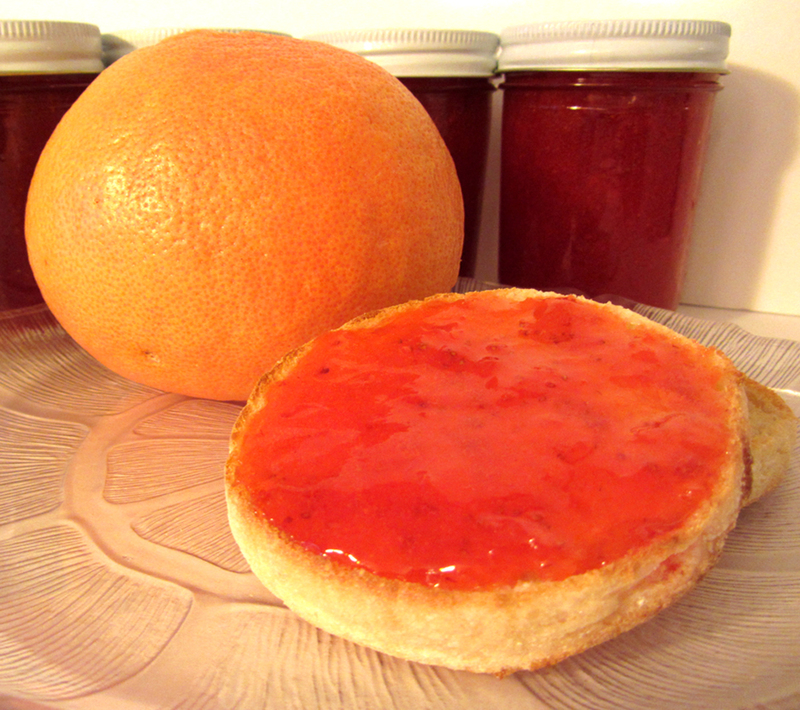 I wanted to put that bright flavor into a jam. Strawberries and oranges go so well together, that I thought it might make a good pairing with grapefruit, too. And it did. The color is beautiful. 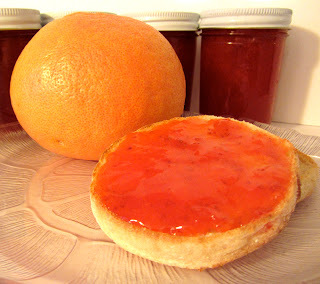 And the flavors are perfect - this jam tastes like sunshine! A must try! 1. Prepare canning jars, lids and rings, a funnel and ladle, and a canner. This recipe makes 5 half-pint jars. 2. Mash the strawberries with a masher OR pulse them in a food processor. No large pieces should remain. Cut the grapefruit into small pieces (double check that it is fruit only - remove all pith & membrane). 3. In a large stock pot or Dutch oven, combine the strawberries, zest, grapefruit, and pectin. Set the pot over high heat. Cook, stirring often, until the mixture comes to a boil. 4. Stir in the sugar and return the mixture to a rolling boil. Boil hard for one minute. 5. Remove the pot from the heat. Let the mixture settle for about a minute. Skim off any foam (later, you can stir this to deflate the bubbles and use it - it tastes perfect, it just isn't suitable for canning). 6. Ladle the jam into the prepared jars, leaving 1/4" headspace. Clean the rims. Attach the lids and rings. 7. Process the jars in the canner for 10 minutes. 8. Transfer the jars to a rack to cool completely.